Eagle Quartz is a maintenance free surface that is not easily damaged Following a few simple instructions will keep your countertop looking like new for many years to come. • Use mild soap and warm water for routine daily cleaning. Be sure to rinse thoroughly. • For stubborn spots, use a soft cloth or a non-scratch scrub pad, and a mild non-abrasive cleanser, with a neutral PH. • For dried residue, a flat object such as a plastic putty knife can be used to gently scrape off the foreign material. 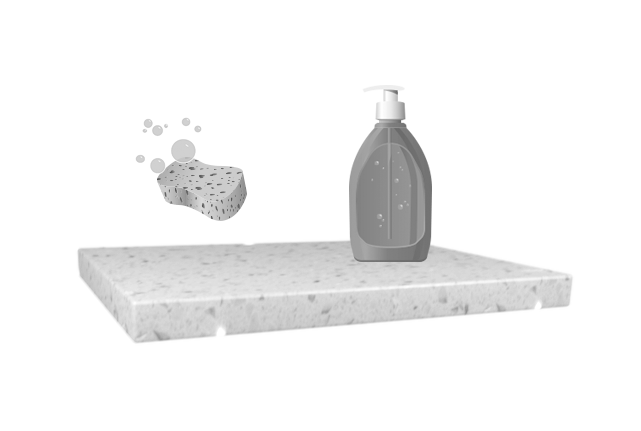 • Although Quartz is extremely scratch resistant, it is not scratch proof. You should never cut or chop directly on your countertop. Always use a cutting board. • Always use a hot pad or trivet when setting down hot objects, such as hot pans or plates. Direct contact with extremely high heat can cause damage. • Take care to avoid spilling harsh chemicals such as drain cleaners, paint strippers, oven cleaners, bleaches, etc on your Quartz countertop.